Atlanta Braves .... Hank Aaron Holds A Place Of Honor, There Are Many Others? When major league baseball began in 1871 the Braves were born in Boston. Atlanta Braves the team, and Atlanta,Georgia the city and the state, all of which have unique and colorful storied histories from their beginning to the present and stretching now on into the bright future. After opening the gates and spinning the turnstiles in 1997, the "Home of the Braves" has quickly become an Atlanta landmark and the benchmark for many future baseball park as a model for design. Turner Field has combined the nostalgia and the atmosphere of old-time baseball with a state-of-the-art environment unlike any other park at the time it was constructed. "Speaking of Turner field Hammerin Hank put me over the fence many a time when He came to Atlanta with the Braves from Milwaukee.
" Now that the Chipper is retiring at the end of the 2012 season I felt like I might get a spell to catch my breath and dust of my tanned hide but it looks to me like McCann has picked up the habit of doing cruel and unusual homer punishment on little white baseball me." "These Atlanta Braves just keep on keeping on as contenders year after year sure make life tough on us baseballs." Twas a fitting and grateful thing when major league baseball took the initiative and let the franchise owners bring the Braves into Georgia and the southlands home of one of our original thirteen (13) colonies. The Atlanta Braves history and legacy was born early in the historic city of Boston the founding home grounds of America where our Country and dear ole Major League Baseball began it's fantastic journey through history. In 1871 as professional teams were being organized, a team in Boston called the Red Stockings, suited up and was proud to call Boston's South End Grounds their home. The name Red Stockings harkens back to the beginning days in baseball when baseball terminology identified the team names nicknames or logos and had a significant visible meaning. From the very start or get go, the now proud Braves went from calling themselves the Red Stockings to the Bean Eaters, to the Doves, to the Rustlers, to the Bees and finally today being satisfied as Americas Team the Atlanta Braves. You can now see as history moves along many things change such as team names,team logos, cities where teams play,the signature nicknames and also we have adapted from our baseball playground rules as they were overcome along with the many other norms of our baseball game. After spending seventy-seven (77) years in Boston, Massachusetts, and thirteen (13) in Milwaukee, Wisconsin, the Braves moved to Atlanta to begin the 1966 season as Major League Atlanta Braves Baseball. The move made the Atlanta Braves the first major league professional sports baseball team to move into the deep South and having claimed a home here in the South. Many great and famous baseball players have proudly worn the Braves uniform. Could you possibly name a few? Unique Features: The outfield fence is 8 ft. in height and contains bleacher seats beyond the outfield fence. The slightly asymmetrical playing field with grandstand seating looking out across the outfield with a view of downtown Atlanta. The Golden Dome of the Georgia State Capitol stands proudly within viewing distance. We must remember Georgia was one of the original thirteen (13) colonies of the United States Of America. James Oglethorpe and some of his associates were granted a right to colonize the province of Georgia from King George II and in late 1732 with a load of prisoners released from debtors prison aboard the ship Ann landed at a site near present day Savannah,Georgia. Georgia was the last of the original 13 colonies chartered by the English to settle as a colony in the New World of America. From Georgia and the Carolina's spread the growth of the South and the South East and then turning further West through Mississippi, Louisiana, Arkansas and then the Republic of Texas. Atlanta Baseball Braves call it home but early history of our country proved this area to be the spawning ground for Brave frontiersmen venturing further South and West. The ball park has a special area at the ball field known as Monument Grove honoring such Brave greats as Hank Aaron, Eddie Mathews, Dale Murphy, Phil Niekro and Warren Spahn as well as the unstoppable indomitable "Georgia Peach" Tyrus Raymond "Ty" Cobb. Multi-Purpose Uses: Built for the 1996 Olympics and converted to a baseball-only park for the Braves. April 4, 1997 Opening Day for the Braves in their new Atlanta Baseball ballpark. Ball Park Owner/Owners: Owned by the Atlanta Braves. Historical Events: First Game April 4, 1997 Atlanta beat the Chicago Cubs 5-4. Chipper Jones collected first hit for Atlanta in the new ballpark City Landmarks and Tourist Items: Ballpark is located 1 mile from the heart of downtown Atlanta. Atlanta being the State Capitol of Georgia has many significant and historic tourist attractions. Atlanta's most famous formulated invention or concocted thirst quencher is also the world's most popular soft drink and nowhere is this more clear than at this unique downtown museum. The new 20-acre (eight-hectare) complex Address: 121 Baker Street Northwest, Atlanta, GA Website: http://www.worldofcoca-cola.com/ features a 4D cinematic experience, and the largest collection of Coke® memorabilia ever assembled, including a pop-culture gallery. The museum draws many visitors, and features an exhaustive look at the history, manufacture and distribution of Coca-Cola. Perhaps the most popular phase of the tour is the final stop, where guests are invited to sample vast and various recipes of Coke as it is marketed throughout the world. Located in the city or very near the Atlanta Braves are must see sights of Atlanta. Stone Mountain National Park and Monument is only a short drive from the city. The Civil War Cyclorama Museum is a must to visit. Once you have seen this vivid portrayal of Civil War activity you will never forget it. The history of Atlanta and the Civil War action is also vividly brought to life by Margaret Mitchell's book, "Gone With The Wind." The Cyclorama brings to life the reenactment of this tragic and history turning moment in our South and The Nation. If and when you do visit Atlanta be sure you have a ride down Peach Tree Street. With my tongue in cheek I will venture to say if you have or ever do visit Atlanta you have surely been down or will travel onto Peach Tree Street. Ironically the "Braves", the baseball Boston Braves and now the Atlanta Braves are the only team in all of baseball history with the credentials to claim two of the greatest home run hitters to step across the chalk lines and play the game of baseball. Babe Ruth was the greatest and most honored name in baseball and Hank Aaron became the mightiest of the all time home run leader (total 755) to ever play the game until. Up jumps Baseball 2007 with "The Big Chase" and Barry Bonds took the lid off of the teapot and slammed his way to match and surpass these two (2) Great Legends to gain home run number 762. Aaron was a right handed hitter. Hank "Hammering Hank" broke Babe Ruth's record 714 home runs by hitting No. 715 in Atlanta Stadium with the Atlanta Braves--on April 8, 1974. He hit a grand total of 755 home runs during his career. Henry "Hammering Hank" Aaron retired in 1976. The Braves thrilled Boston fans from 1871-1952 as the Boston Braves. Milwaukee could claim them from 1953-1965 and then from 1966 to the present they are now the Atlanta Braves and Atlanta Baseball. From the beginning of major league baseball to the present day the Atlanta Baseball Braves are a proud team with a heritage second to none and a proud history. Atlanta, Georgia is the home of the National League East Division team the Atlanta Braves. The city of Atlanta has a past as rich in history as it's team. Our grand and glorious country before it could claim the title United States Of America, had a humble beginning of thirteen (13) original colonies. Georgia, home of the Atlanta Baseball Braves, was one of those original colonies. Atlanta became the most populous city and the state Capitol. Just as our Braves have camped out and enjoyed three cities to be their home, Atlanta has enjoyed three names and even a nickname "Hot AtLanta.". Atlanta,Georgia was founded in 1837. It's original name was called Terminus, then in 1843, renamed as Marthasville and in 1845, it became Atlanta. Within the greater Atlanta area with close proximity to the city are points of history and places no traveler into the South would want to miss. Come to Atlanta enjoy a day or so attend a baseball game at the ball park beautiful Turner Field, home of the Atlanta Braves, and also take in all the surrounding area of the Cities historical sights. Two sights are a must to visit when in Atlanta is nearby Stone Mountain, Georgia. A Cyclorama of the Battle of Atlanta, a masterful painting of the 1864 Civil War Battle, is in the City's Grant Park Museum. The battle for Atlanta was vividly proclaimed and made famous by scenes from Margaret Mitchell's book and movie, "Gone With The Wind." The movie theater for the first showing of this classic film is preserved and still standing in Atlanta. Stone Mountain, near Atlanta ,has huge cut into the stone face of the mountain figures of Confederate Leaders sculptured on the sides of the magnificent Mountain of Stone. Turner Field, home playing ballpark for the Braves of Atlanta Baseball, was built in 1997. The stadium capacity is just a shade over 50,000. The official count is 50,096. To put the ole apple or baseball out of the park, a player must send little white hoss-hide over a fence, in left field: 340', center field: 400' and down the right field line: 330'. Turner Field replaced Fulton County Stadium. The demolition of the old Fulton County site was taken down by Implosion. Atlanta had not witnessed such an explosion since Sherman's Artillery ear splitting cannon barrages came visiting in 1864. Many, many baseball playing seasons predating the arrival of our Braves coming to Atlanta Baseball the fans enjoyed their Atlanta Crackers. The Atlanta Crackers was one of the founding teams of the Southern Association. The Southern Association of Baseball Teams was the forerunner of our proud Southern League Baseball which is now a ten team league of AA Baseball. The Crackers played at the old Ponce de Leon Park in Atlanta. Since I was a young kid enjoying following my Birmingham Barons of the Southern Association, I remember listening via radio broadcasts the down to the wire pennant chases between those Atlanta Crackers and my Birmingham Barons. The baseball fans here in the South knew the Crackers and their Atlanta baseball well before the Braves came to call it their home. 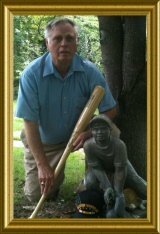 My high school coach "Piggy" Mitchell was also a scout for major league baseball talent. Atlanta Crackers was the home team for a center fielder by the name of "Country" Brown. Brown played several seasons with the Crackers and was one of "Piggy's" proud protege' of his baseball scouting signees. To return and review home page of your introduction of Major Ballparks and Cities Baseball Parks In addition to providing you with some data and history of our Braves and Atlanta I am impelled to share some personal memories. Turner Field owned and constructed by Mr. Ted Turner is not the first storied Turner Field of Georgia. Turner Field in Albany, Georgia was once the home of the United States Air Force base for B-52's. The Air Force B-52 bombers were the heart and soul of our Strategic Air Command. The greatest weapon system the World has ever known was our B-52 Squadrons. The simple putting of the words Turner Field onto my computer to tell you about the Atlanta Braves, my recall immediately went to the memory of one of my oldest brothers. My oldest brothers are twins, Bill and Bob. Bill was career United States Air Force with an excess of 5000 flight hours in B-52's in the Strategic Air Command. One of his tours was being stationed at Turner Field in Albany, Georgia. One moment in history I had a chance to share with my brother was at Turner Field. The Air Force had never tried the concept of having two (2) B-52's take off simultaneously. Two huge B-52 weapon systems poised on the same runway one staggered just behind the other with both starting their take off roll at the same time and getting airborne as a pair ready to receive their mission orders and turn toward their destination. Why this dual take off? The Strategic Air Command was constantly tweaking their response time. It was practice, practice and practice some more from simple being on alert, to being in the air and mission ready not in hours but in minutes and down to seconds. Our Nations freedom was constantly at stake. Thank you for letting me share a memory of my brothers constant mission with you. Baseball fans around the world have a keen interest in Baseball Lingo, Baseball Terminology and Baseball Vocabulary. It's amazing how popular just plain out and out baseball talk could generate such a "want to" know for the baseball language. The Atlanta Braves are recognized around the World by their logo with the red lettered word BRAVES over the red handled Tomahawk. Once upon a time the Braves had an Indian Chief riding a Painted Pinto with a feathered lance dashing around the ballpark for real thrills. Is it Chief Red Cloud?